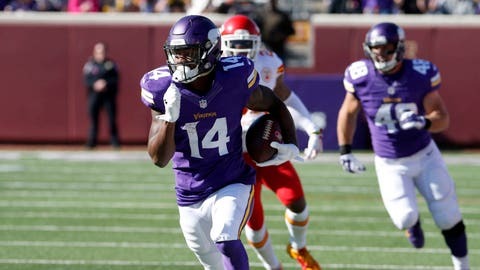 Few knew who Stefon Diggs was when the Vikings grabbed the receiver in the fifth round of the draft. After Sunday's seven-catch, 129-yard performance, coaches, opposing defenses and fantasy owners are going to start taking notice. EDEN PRAIRIE, Minn. — On the biggest play of the game, Minnesota Vikings quarterback Teddy Bridgewater dropped back to pass in the fourth quarter, the Kansas City Chiefs pass rush breathing down his neck on a third-and-15. Bridgewater moved in the pocket to buy some time, keeping his head downfield in hopes that someone could get open. As he let the throw go, it sailed not toward Mike Wallace, the big-money veteran receiver acquired from Miami in the offseason. It didn’t go toward Cordarrelle Patterson, the first-round pick of three years ago who hasn’t been able to break into the regular receiving rotation. And it didn’t go to Kyle Rudolph, the talented tight end who signed a lucrative contract extension last year. It went straight toward Stefon Diggs, a rookie drafted in the fifth round who struggled with injuries at Maryland and has played in two games in his NFL career. Diggs was the one who found the hole in the defense, came back toward Bridgewater and made the catch for a 30-yard gain. 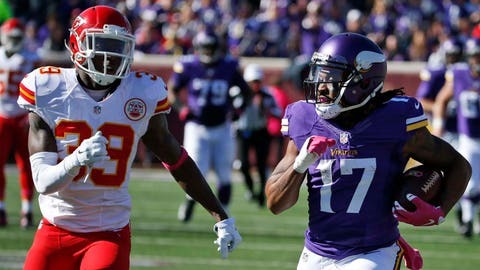 The play of the day set up a field goal and helped stave off some of the momentum the Chiefs were building, allowing the Vikings (3-2) to hold on for a much-needed 16-10 victory. Wallace has been telling anyone who will listen that Diggs reminds him of Antonio Brown, Wallace’s former teammate with the Steelers and a sixth-round pick who has blossomed into one of the best receivers in the league. After Diggs’ seven-catch, 129-yard day against the Chiefs, maybe some of those skeptics will start to take him seriously. "He’s a game changer, to me," Vikings running back Adrian Peterson said. "He’s a talented young guy. He plays extremely hard, and you’re going to get his best effort." Diggs got his chance before the bye when Charles Johnson missed the Denver game with a rib injury. His first career game included six catches for 87 yards and quickly earned him Bridgewater’s trust. "I mean we all knew he could ball the whole time," Wallace said. "It was never a question of that, it was just a matter of opportunity. Every time I do an interview I say I think we have guys that can play on any roster in the NFL. So I think he’s a great player. Humble kid, and he’s going to keep working, I know it." While Patterson is a bigger, stronger prospect, he played only one season at Tennessee before entering the draft and has had difficulty mastering the nuances of route-running and the coverage reading demanded of receivers. That has left him relegated to kick returns and the spot duty on a run play here or there. Diggs was tutored by former NFL standout Keenan McCardell at Maryland, and he has shown a precision rare for rookie receivers. Nineteen of them were drafted ahead of Diggs in May, but despite playing in just two games this season, he is third among all rookies in yards receiving and first in yards per reception (16.6). "He’s one of the (most) polished receivers I’ve ever seen come in as a rookie," Vikings cornerback Captain Munnerlyn said. All of Diggs’ teammates point to his work ethic in practice as the main reason for his quick ascension. "I love the fire that he has," Peterson said. "Walk-through? It’s not a walk-through for him. He’s out there sweating, and it goes to show when he gets out here and he plays." "It’s a walk-through and he’s going out there like it’s a real practice," Munnerlyn said. "We’re like, ‘Man slow it down a little bit.’ He’s a young guy eager to be great. That’s the thing with him. He wants it so bad. That’s what makes him special." While most of his teammates take it easy in those Saturday morning jogging sessions, Diggs works up a sweat because he is "not really good at going through walk-throughs. I have to go at a good pace because how you practice that’s how you play." "I work really hard. Walk-throughs, I take everything seriously," Diggs said. "I take my craft seriously."